On October 30, 1861, Oliver Case seems to have inadvertently admitted to participating in making himself absent from the camp without permission. On this evening, Oliver and a large group of 8th Connecticut soldiers were given approval to attend a lecture by the regiment chaplain, Joseph J. Woolley, in an undisclosed location in Jamaica. The purpose of the lecture was to raise money for a regimental library to be used by the soldiers during their training at the camp of instruction and at future locations. It seems that after the lecture ended, Oliver found it was about 9:15 PM and that “it was no use then to start for camp as it was after roll call.” However, he does not comment on how or where he spent the next hour and forty-five minutes until he “went back to camp and ran the guard.” It’s likely that Oliver saw fit to share in some of the culinary hospitality being offered by the citizens of Long Island. It is possible that Oliver spent this time in conversation with Chaplain Woolley and the other soldiers following the lecture with whom he was very impressed. Oliver wrote to his sister that Woolley was “an excellent chaplain – he is an eloquent preacher as well as a very social and agreeable man – and I believe is universally liked by the men.” A common thread running through his letters is a strong Christian faith and a keen interest in theology. Oliver’s faith will be tried and tested in the months ahead as he faced death and illness. Joseph Woolley was the first of two chaplains assigned to the 8th Connecticut during Oliver’s time with the regiment. The Rev. Woolley was a native of Bridgeport, Connecticut and entered the ministry in the Methodist Episcopal Church only two years before the war began. He would serve with the 8th during the Burnside expedition in North Carolina, but was discharged due to the effects of typhoid fever prior to the beginning of the Maryland Campaign. After his recovery, Rev. 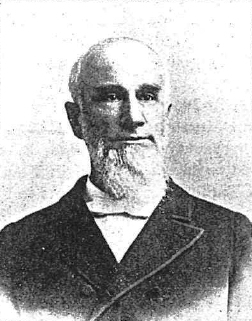 Woolley would go on to serve as pastor of several churches. At the unveiling of a statute honoring General Burnside in Providence, Rhode Island on July 4, 1887, Rev. Woolley delivered the invocation. While in camp at Long Island, religious fervor ran high for the Connecticut men including amongst of the Eighth. Each regiment also organized and supported a Sunday school…The Eighth held a regimental prayer-meeting every Sunday night at their chapel, — “an enclosure of trees and earth, with walls six feet high, and no roof.” Just before sailing, about fifty partook of the communion here. The atmosphere for religious awakening in the regiments gathering at Jamaica is fueled by a notable revival that swept through New York City only three years earlier. A financial and currency crisis had occurred in the United States during late 1857 creating great consternation with businessmen and investors. As the financial capital of the country, New York City was particularly hit hard causing despondency for those who depended on a healthy economy for their livelihood. Businessmen soon began to gather for prayer meetings in the financial district of the city. These gatherings grew into a nation-wide revival that lasted for the full course of the war. This wide-spread religious activity, with more or less of fluctuation in different sections of the country, continued until the outbreak of the rebellion. There were numerous revivals and many conversions in the years 1859 and 1860. Some of the daily meetings were maintained entirely through the war, and are still in operation. It is hence impossible not to recognize the immediate and immense influence of the prevalent and zealous Christian life in the nation upon the shaping of the events which preceded the war, as well as upon the character of the troops sent to the field, and the voluntary agencies organized for the temporal and spiritual welfare of the army. As the soldiers prepared daily for battle at the camp of instruction, many became aware of the potential spiritual consequences of what may lay ahead for them. Stories of death and dying in battle were plentiful from the veterans of the regiments engaged at Bull Run just three months earlier. Religious services were standard fare for the troops and normally well attended with many prayers earnestly offered up during these meetings. Solemn prayer goes up to heaven for strength in the hour of trial, and earnest prayer for protection from temptation’s power; comrades press home upon their fellows the necessity of safety in Christ; tearful eyes and softened hearts attest the fervor with which all unite in the petition for dear ones left at home- And so the hour passes almost unnoted, and men are surprised when the chaplain pronounces the benediction. Religious movements and revivals were commonplace in the Union camps throughout the war. Northern regiments were authorized chaplains and a variety of Christian organizations contributed an array of religious resources to support Union soldiers. The Lincoln administration fully encouraged these efforts removing bureaucratic obstacles and making it easier for these groups to establish their operations in the camps among the soldiers. Most prominent among the organizations seeking to meet the religious needs of the soldiers was the United States Christian Commission (USCC) who enlisted civilian men and women to provide Testaments, religious tracts and other printed material to the soldiers in camp. Although their primary objective was the elimination of sinful influences in the camps and conversion of wayward souls, the USCC mission continued to expand as the war progressed to include provision of food and medical care. During the fall of 1861, the USCC provided a much needed boost of support to the Chaplain Corps of the Union army which struggled to establish standards and procedures for ministering to the soldiers. The 8th Connecticut was certainly fortunate to have a chaplain as dedicated and caring as Rev. Woolley. This entry was posted in Long Island and tagged chaplain, Jamaica, Long Island, Religion, revival, Woolley. Bookmark the permalink.